Dishaw Guitar Studio will provide free all day clinics for those who attend the Music Industry Conference (MIC). The event will be held on October 8-9 at the downtown OnCenter. My son and I are CNY natives and well known for expertise in manufacturing of electric guitars as well as restoration of string instruments and factory authorized service. 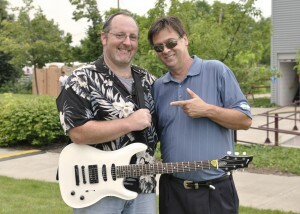 Mark has signed with guitar maker Dan Dishaw from Syracuse, New York. Dan has over 35 years experience in the Music Industry business. He has been an authorized service facility for 15 major manufactures such as Gibson, Fender, Ibanez, Ovation, etc. In addition, he is well known for his meticulous restoration expertise on a wide variety of rare and collectable vintage string instruments. After a lot of networking back and forth on the specifications on a guitar that Mark would love and play exclusively, Dan delivered and Mark is extremely happy. Quote from Kendall; " I am blown away from Dan's work. These guitars are not the typical off the shelf bolt on or set in neck designed instruments, their neck thru body design delivers unbelievable sustain and superb playability like no other. He is a total professional in every way and my new MK Mach Series guitars play amazing. The MK Mach I and MK Mach II are the most consistent playing guitars with tone and playability that I have ever picked up, these guitars really rock”. We have come up with the 1st line. They will be the “Mark Kendall Mach Series.” Each guitar will come with an autographed 8x10 and a certificate of authenticity. Go to: http://dishawguitars.com for additional specifications and your purchase options on this new beauty!!! Go to: http:// greatwhiterocks.com for more info about the band or to check tour dates. 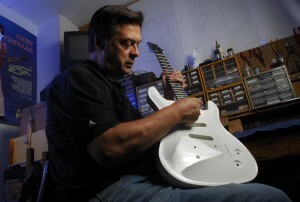 Syracuse guitar maker Dan Dishaw had good news as he called me on his cell phone from the Syracuse Inner Harbor. "He likes that silver one. As I knew he would. 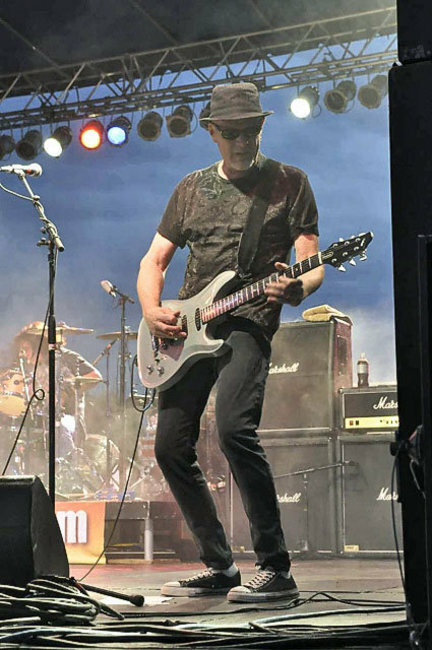 That's his favorite right now," Dishaw said as lead guitarist Mark Kendall of rock band Great White played during the sound check for tonight's Wednesdays on the Water show at the Inner Harbor. "I'm sure it's going to be a go," Dishaw said. "He's liking it. I think he's going with it for the show." 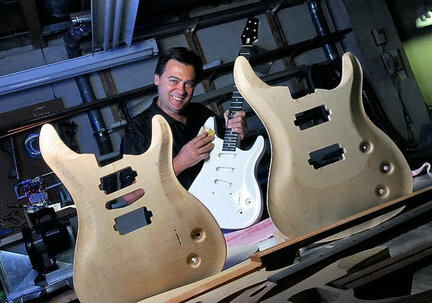 As I wrote in Monday's Post-Standard, Dishaw built three guitars on specifications from Kendall. Kendall said if he liked the way they sounded, he'd not only use one during tonight's show, but he'd enter into a business arrangement with Dishaw. "If he wants two, I'll give him two," Dishaw says. "If he wants three, I'll give him three. But I would like to sell one of them. "Whatever he wants is fine with me. He's liking the way it feels and sounds," Dishaw said. "We'll start a business plan and see what happens." Pictured: Mark Kendal playing in Las Vegas with his Dishaw Guitar. Dan Dishaw says goose bumps ran up his arms when Mark Kendall of Great White stepped on the stage at the Syracuse Inner Harbor on Wednesday using a guitar Dishaw had built for him in his Bellevue Avenue shop. 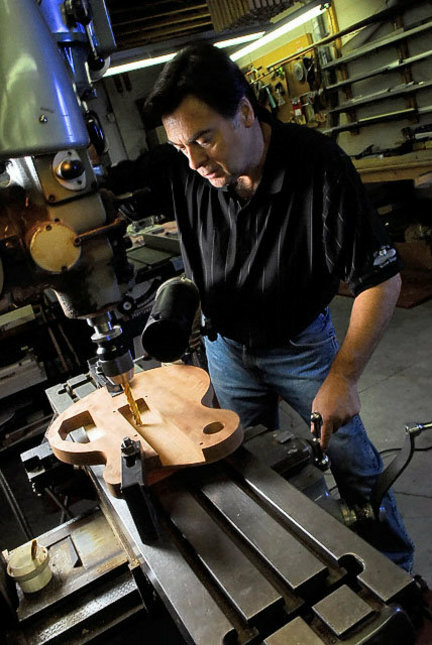 Dishaw built three guitars to Kendall’s specification, after months of trading e-mails to make sure the guitar-builder knew what the guitar-player wanted. Kendall took the silver model with him, to continue to use during this tour. Dishaw will ship the tobacco sunburst model to Kendall’s home in California. And, Dishaw can sell the white model. Dishaw says he and Kendall will continue business negotiations. “We talked about coming up with a signature series guitar for him. We’ll come up with a business model for it.’’ Basically, Kendall would endorse the guitar line and receive a percentage from each guitar in the line that Dishaw sells. In fact, says Dishaw, another of his guitars sounded fantastic on stage Wednesday night. 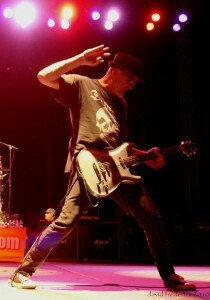 Kevin Farrell, lead guitarist for Syracuse rock band Kane, also used a Dishaw-made guitar. Dishaw said he worked on Farrell’s guitars when Dishaw was a technician at the now-defunct Gerber Music. And now they’ll talk about Dishaw building a special model for Farrell. Photos courtesy of Dan Dishaw. Mark Kendall of Great White plays the guitar built specially for him by Dan Dishaw of Syracuse on Wednesday, June 23rd at the Inner Harbor. Dan Dishaw will know just how good his son’s idea was when Great White lead guitarist Mark Kendall visits Dishaw’s shop on Wednesday and puts his talented hands on three custom-made guitars for the first time. As he prepared for his last semester at SUNY Potsdam last winter, Peter Dishaw pitched a new venture to his father. Why not start building custom guitars in the 3,400-square-foot shop behind the family home on Bellevue Avenue in Syracuse, where the elder Dishaw for more than 20 years has made billiard cues of such acclaim that one of them is on exhibit at the Smithsonian Institution? Dan Dishaw was no stranger to the musical instrument. The Syracuse native, 60, did service work on guitars, keyboards and amplifiers for Gerber Music in Syracuse and became an authorized technician who worked for himself when that store closed in 1982. Building guitars merged those worlds. He could work with wood for the guitar bodies and electronics for their sound. One of those collectors was Jay Helfert, a pool player of some note from California. And one of Helfert’s friends was fellow Californian Kendall. “He e-mailed me and said, ‘There’s a master cue-maker guy who’s interested in working with you,” recalls Kendall. “I went on (Dishaw’s) website and liked what I saw.” Beginning in January, Dishaw and Kendall traded more than 20 e-mails, specifying just what Kendall wanted in his electric guitars. “He asked a lot of questions. I asked a lot of questions. I answered all of his, and he answered all of mine,” Kendall says. The result is three guitars: a white one (for Great White, says Dishaw), a gray one and a golden one the builder calls tobacco sunburst. Great White is in Syracuse to play at the Inner Harbor on Wednesday night. Dishaw says he’ll pick up the musician that morning and bring him to the shop for his first look at the guitars. “I’ll just pick them up and kind of noodle,” Kendall says. “I’ll grab it and play some chords and listen for tone.” It’ll be a personal experience. “When I play certain guitars, like a Strat(ocaster) or Gibson, it’s like the guitar makes me write songs a certain way,” Kendall says. “The tone of a guitar will make me write a piece of music a certain way.”Kendall says he’ll know if he likes Dishaw’s work in a matter of five minutes or so. “In that amount of time I’ll be able to tell if it’s musical or not,” he says. If it’s musical, expect the guitar to make its debut that night at the Inner Harbor. Dishaw says he’ll give two of the guitars to Kendall if he likes them, in exchange for his endorsement. The two will be worth about $7,000, Dishaw says. “We’ll come up with a business model,” Dishaw says. “I’ll make a series of guitars and sell them, and he’ll get a percentage. “I don’t think I can buy advertising that would be worth as much as his name attached,” says Dishaw, who’s also in the process of building guitars for Syracuse native Joe Jewell, who lives and performs in Los Angeles, and of doing guitar restoration work for Spyro Gyra’s original guitarist, Chet Catallo. What: Syracusan Dan Dishaw, known for his custom billiard cues, has started a line of guitars. Where: Dishaw and his son, Peter, work in the shop Dan constructed behind the family home. 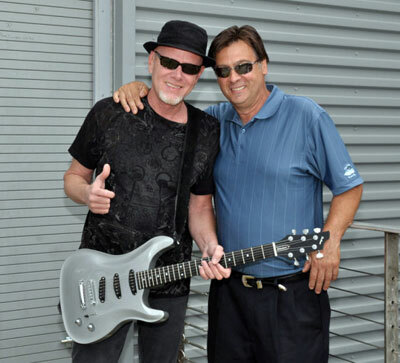 Connection: Dishaw has three guitars constructed to the specifications of Great White lead guitarist Mark Kendall. 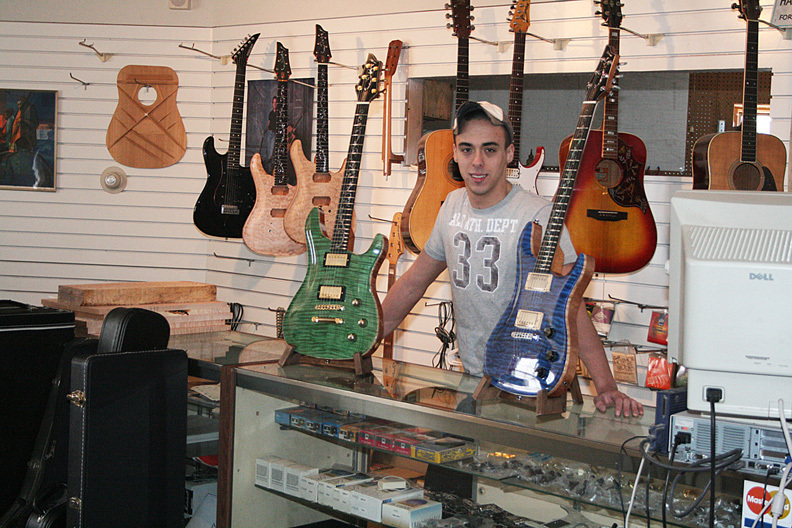 Kendall will visit the shop Wednesday to see the guitars for the first time. Mark Bialczak can be reached at 315-470-2175 or mbialczak@syracuse.com. He posts frequently at www.syracuse.com/entertainment. After 20 years in the billiard industry, designing and building exotic billiard cues, I am back to where I started, with musical instruments. 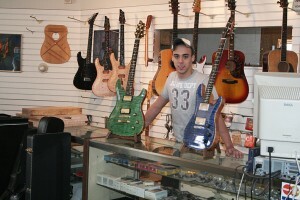 I am doing certain types of repairs but my main focus is building Dishaw Custom Guitars with my son Peter.